For this recipe the salmon undergoes two separate cures, each lasting 24 hours. All other garnished should be prepared in advance so all you have to do is garnish the plate. Next day unwrap salmon, scrape of and discard the first marinade. Mix the chopped herbs, layout the cling film as before and smear with the Dijon mustard and finally top evenly with chopped herbs, wrap tightly with cling film and refrigerate for a further 24hours. Mix all ingredients to preferred taste, be careful not to add to much lemon juice as the crème fraiche will become to tin. To assemble the dish, finely slice the salmon and place on a plate garnish with the rest of the garnish ingredients as per the photo. Chef/Patron Gavin McDonagh’s food philosophy has been wrought over the hot plates of some of Ireland’s finest establishments. An impressive career path that has included senior posts in Michelin Starred restaurants like L’Ecrivan and Restaurant Patrick Guilbaud in Ireland. A well travelled journey too with time spent in France, Germany & The UK. His passion for fine French cuisine reveals itself in the care and attention to detail that each dish shows bringing a real flair to the table. 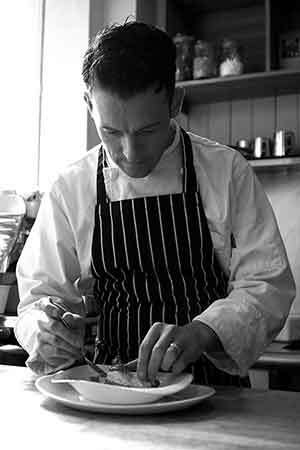 The focus of his cooking in on fresh in season Irish produce and refined cooking using French culinary skills to deliver a modern French tasting plate experience.